Bologna is the largest city in the province of Emilia-Romagna and Rimini is one of its most famous resorts. 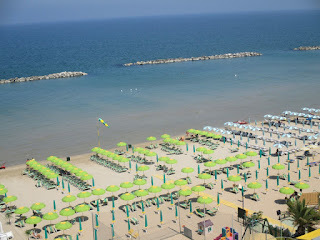 The equivalent of America’s spring break occurs in Rimini. Adjacent to Emilia- Romagna is Le Marche and Tuscany and Umbria lurk nearby in this central area of Italy. Le Marche is perhaps the wallflower at the party. It’s friendly yet curiously laid back and unobtrusive, exuding neither the mercantilism of the industrial north nor the explosive architectural treasures of Italy’s living paen to antiquity, Rome. Its beauty is like that of the friendship that turns into a love affair. It doesn’t exude passion, but there’s an openness and willingness to the people and environment that make the visitor feel as if he or she were taken into an embrace. As you travel through the mountains above resorts like Pesaro you feel like the countryside belongs to you. No doors are being shut. There’s no feeling of internecine pleasures from which the average person is excluded. Charming villages lay shuttered in the night and along the seashore teenagers form their age old covens as they sit in semi-circles above darkened cabanas. 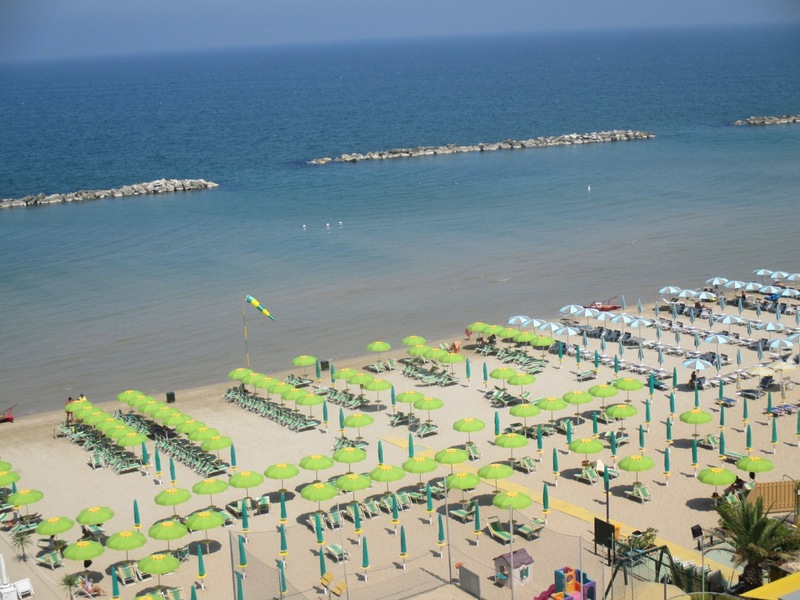 The waters of the Adriatic are calm and in the morning couples stroll the empty beaches, with their regimented lines of umbrellas, as the sunlight dances along the water. You might say that Le Marche is the place to go when you’re not looking for excitement; you might also say that it’s perfect destination for those who don’t need it.